For kitten availability, please contact us by email or call 215.295.5421. 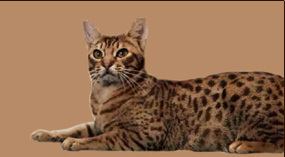 CFA Registered Cattery Specializing in Chocolate Spotted and Chocolate-Silver Spotted Ocicats. 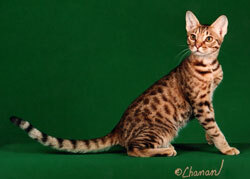 This is a man-made breed catering especially to those who have a kinship with the wild and exotic. The big plus is that though they look wild, their personalities are those of the most loving domestic cat... loving seems to be their specialty, whether it be their humans or other household pets. They are not just another pretty face, but the corner stone most likely to tie a home and its family together.